Height 5 feet 11½ inches. Weight 12 stone 4 pounds. Chest measurement 34-39¼ inches. Complexion fair. Eyes blue. Hair sandy. Sight, hearing and colour vision all good. Limbs and chest well formed. Full and perfect movement of all joints. Heart and lungs normal. Teeth - some false. Free from hernia, varicocele, varicose veins, haemorrhoids, inveterate or contagious skin disease. Not vaccinated. Good bodily and mental health. No slight defects. No distinctive marks or marks indicating congenital peculiarities or previous disease. Wounded on 15 September 1916 prior to being killed in action. David Steele Keay was born on 9 October 1889 at Fairlie, near where his father owned and farmed Corra Linn Station at Sherwood Downs. He was a son of William Robert and Ellen (née Steele) Keay. Mr Keay had been long resident in the Fairlie district and was held in much respect and esteem. During the depression of 1893 the family left Corra Linn and moved to Herekino in the North Island, their property there being named Sedgeley. In the north William served on the Whangarei County Council and was active in county affairs. David and his brothers, Bob and Thomas, appear to have been the mainstays of the Herekino cricket team, all starring with both bat and ball. Bowling in a match against Kaitaia in February 1915, he ripped through the opposition in both innings. David was living at Herekino and working as a carpenter when he enlisted in October 1915. He was a well built fit young man, standing almost six feet tall and weighing over 12 stone. With others in the Special Reinforcements, he was to leave Whangarei on 12 October and proceed directly to Trentham. 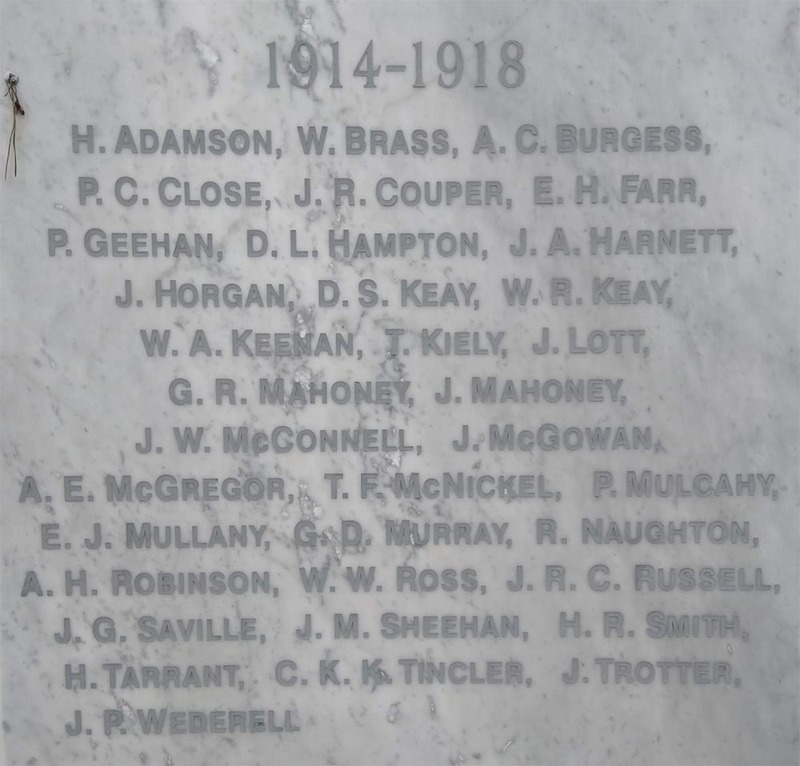 He was one of 105 volunteers from the North who were to be dispatched to the Front and who were farewelled on 12 October 1915. ‘At the drill hall the men assembled merrily. They whiled away the waiting time in song. When it came to "attention!" they were "on parade", and "Right here!" was the enthusiastic response to their names. . . . They cheered as they left the hall. . . . . The volunteers sang "Tipperary" on the route. Presently a call came: "Are we down-hearted?" And the thunderous response came: "No!" '. How long before some of those responses were silenced? Less than a year for David. Rifleman D. S. Keay left with the New Zealand Rifle Brigade by the “Mokoia” in February 1916, destined for Egypt. In September he was wounded. Later on the same day, 15 September 1916, he was reported as killed in action at the Somme – another who had made the supreme sacrifice in the cause of the Empire. He is buried in the Bulls Road Cemetery, Flers, Somme, France. To add to the family woes his brother William Robert KEAY (Bob) was also killed in action a year later in 1917. Both David and his brother Bob are remembered on the Herekino War Memorial and the Herekino-Whangape Memorial Tablet. They are also recorded on the Roll of Honour at the Auckland Provincial War Memorial Museum. A plaque with the names of both sons has been placed on their parents’ grave in the Herekino Public Cemetery. In a family memorial notice in the New Zealand Herald of 15 September 1917, David and Bob were remembered as "generous and affectionate sons and brothers and warm-hearted friends. They fought and died for national freedom and righteousness." David’s medals, scroll and plaque were posted to his father. David's father received letters from officers and friends after his death. Unfortunately they have not survived, but his father did note in his own correspondence that one officer praised his son for his intelligence and fearlessness. David was employed as a sniper in the trenches at Armentieres. He was an excellent marksman but one day, when he was about to fire on an enemy soldier, his rifle stock was hit and shattered by a return bullet. He was not injured but the "little rifle was made useless". An older brother, Thomas Melville Keay, farming at Herekino, was called up in 1917, but was not required to serve. William David Keay, who served in World War Two, was a son of Thomas Melville Keay and was named for his two uncles who were killed in World War One. Thomas Keay of Fairlie, who was killed in action in 1917, was a cousin of David Steele and William Robert Keay.